Cut the mushroom tops in half. 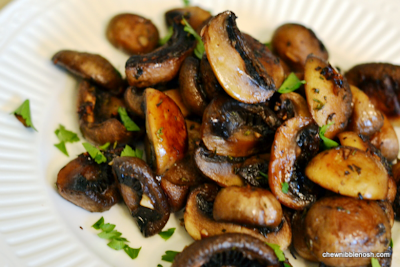 Toss the mushrooms with the 2 tablespoons olive oil and season well with salt and pepper. Spread the mushrooms out on a cookie sheet. Roast the mushrooms for 15 minutes. and 1 teaspoon olive oil. the mushrooms with the Balsamic-garlic mixture. begun to brown and caramelize. Oh, my. I'm always on the lookout for mushroom recipes. These look and sound awesome. Thank you, Maria. You are completely right: they are awesome. Thank you very much for your comment and visit.